It's time for another recipe. I've loved this simple dish for as long as I can remember. Probably ever since my first trip to Greece as a young child. Whenever an old memory from Greece pops up, there's something in me that calls out for this salad. A few years ago I went to Thessaloniki with my dad. We kept coming back to the same restaurant over and over again, only to enjoy this amazing salad. Or let me be honest, the waiters were quite funny too. Especially their faces of relief when they realized me and my dad were not a couple, just a normal dad and daughter traveling together. Anyway, we spent last week in Paris at Damien's sister's and I was asked to contribute a salad to the barbecue table. When cooking for other people it's always a wise decision to prepare a dish that you know. At least if you want to impress, with less stress, and who doesn't want that. 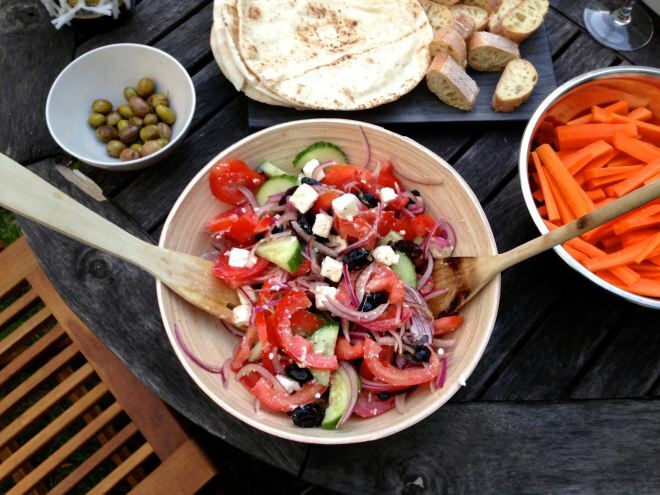 Here is my best advise for how to prepare the perfect greek salad. Find a large beautiful bowl or plate where each ingredient can be placed when prepared. Begin by washing and slicing the tomatoes and removing the pulp. Wash and chop the cucumber into chunks of similar size. Peel the onion before slicing it into thin but-not-super-thin slices. Pit the olives and chop roughly. Cut the feta cheese into squares and crumble some of the squares with your fingers directly in the bowl. Find a bowl where you can mix the oil, lemon juice, pepper, salt and oregano. Whisk with a fork before drizzling over the salad. Gently turn the salad. The salad stays fresh a few hours so if you are prepping ahead for the party. Leave the dressing aside and pour on top one hour or so before served. It works as a main or a side, depending on the occasion and hunger levels.